It seems like the way to go if you're a designer with vintage sensibilities is to take an old school craft and give it a new contemporary look. Just as the craftistas took rocking chair activities such as crochet and embroidery and made them rock-n-roll, John Derian took dowdy decoupage and made it delicious. Seriously. His technique is called reverse decoupage where he applies meticulously cut photocopied 19th century nature illustrations onto the backs of clear glass plates. So what old school crafts are left to make anew? Basket weaving anyone? Liselotte Watkin's art nouveau illustration style is so gorgeous and just mesmerizing. Her trademark girls are uber cool with 'tudes to match. (Wouldn't want to get into a fight with any of these girls...) On her drawing technique, Liselotte says, "I make an outline on transparent paper with a special kind of pen that I order by the box load from Japan. The coloring is done in Photoshop." 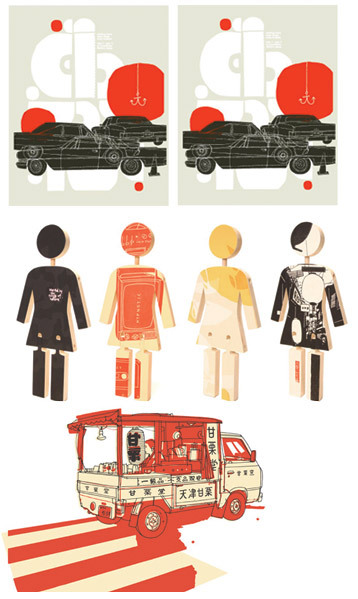 She made a graphic book called Watkins' Heroine ("visual short stories consisting of lines instead of letters") which I've been trying to get my hands on. Unfortunately, it's out of print. Everytime I write off a trend, whether it's a cute birdy, peacock, owl, or deer motif, silhouettes and laser cutting...(um, I missing anything else?) I see something that makes me embrace the trend anew. So I'm okay with birds again after seeing Clare Nicolson's textile work. I believe I saw her work on d*s last year but enough time has passed that it's all new to me again. Of course, I love Clare's vintage style. 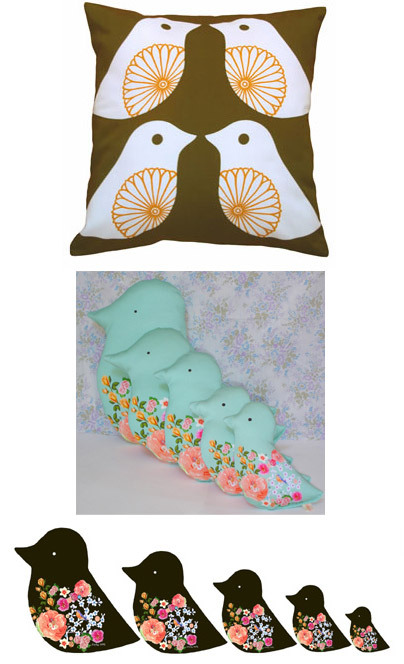 And the stuffed bird cushions inspired by russian nesting dolls are really cute--not to mention a different spin on both the bird theme and pillow design. Maria (mav) posts these great photographs of her studio on her blog. 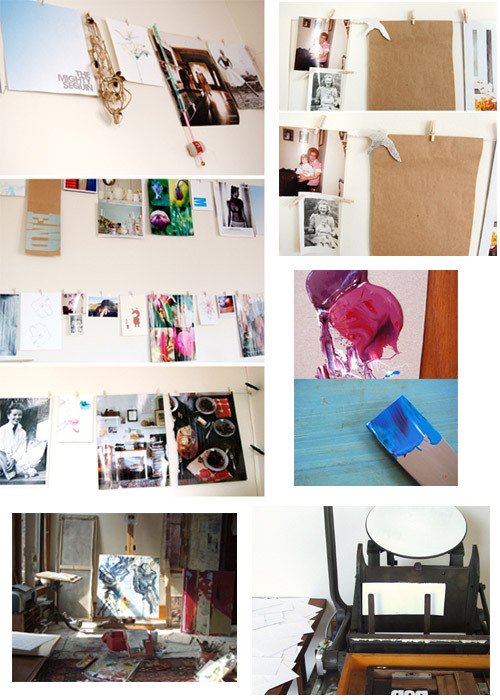 It's pretty common to see inspiration boards in creative folks' studios, but she's got inspiration wires! It's great because the wires can traverse a whole wall and you're not limited to space on a corkboard (so you can clip items in a variety of sizes). And I think it's great that she not only puts tearsheets, patterns, etc that inspire her work, but she also puts photographs of loved ones (which stirs a different kind of creative motivation) like her heroines, her grandmothers. I also like to visit her blog to see the photographs she takes. They embody the stillness, serenity, and solitude (ooh 3 S's) that I associate with coastal towns like Portland, Maine. It's a great advertisement for getting away from metropolitan cities. Click here for Maria's post on whip up about surrounding yourself with inspiration. Designing concert posters must be one of the coolest design gigs to score. It must be exciting to work/collaborate with minds from another creative discipline (especially musical talents in indie bands)--in this case, transform their personality/music style into graphic form. 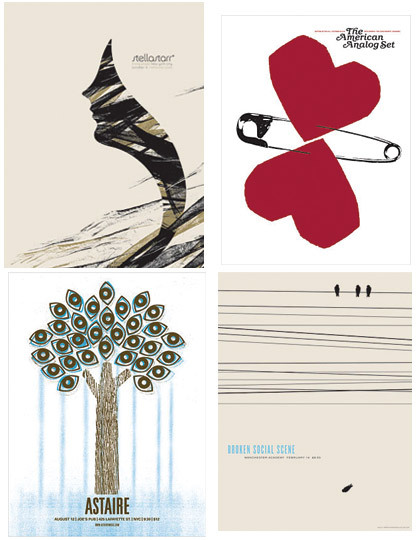 Jason Munn's poster style is one of my favorites: it's simple, well edited, and communicates a visual narrative well. Again with my inclination for jewelry made of non-traditional materials, here's a designer (Marzio Fiorini) who uses rubber in imaginative ways. The extent of my experience with rubber jewelry was wearing those black rubber bangles back in the 80s. (Thank you Madonna.) I like his choice of colors and especially the way his earrings look like they're made of coral. It's hard to believe that they're tiny pieces of rubber. The circular-form necklace appeals to my mod sensibilities--though I don't know if I could pull off wearing it. 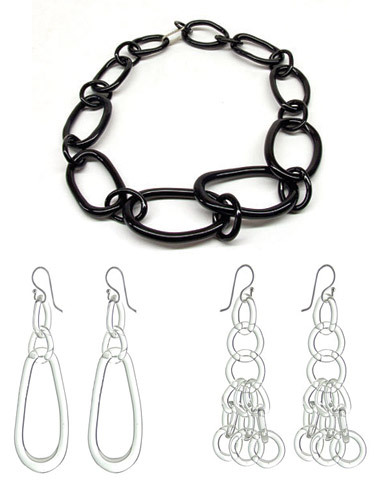 If you're interested in buying some of his jewelry, they're available online at SFMOMA. The Museum Shop has a larger range of his stuff if you can visit. I enjoy totes (canvas in particular) because of its range of design possibilities at relatively inexpensive prices. No one has explored these possibilities more so than Rootote. They're a veritable melting pot of totes on full boil. 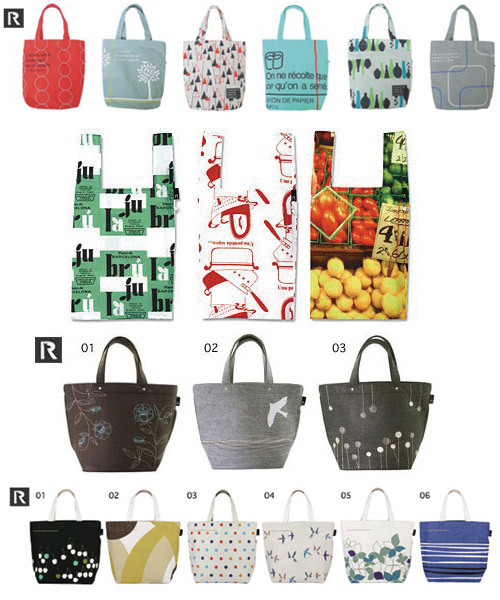 They offer totes in varying sizes, shapes, colors, illustrations, and fabric. Heck, they even got bags in several languages! And if that isn't enough, you can even custom design your tote...in case the other hundred or so styles weren't quite what you were looking for. What do you think of when you hear the word "Pyrex"? I think about clear glass baking dishes or those milky white vintage casserole containers. And of course, I start imagining the food that comes in them like brownies, bibinka (a filipino dessert), casseroles...rice krispie treats. Now, I'll have to add jewelry to that list of Pyrex glass imagery. (Yes, this is jewelry made from Pyrex!) It's fascinating to see something as humble and clunky as Pyrex transform itself into an absurdly delicate, georgeous necklace or pair of earrings. I love it when designers use non-traditional materials in their work...especially in jewelry design. I like design that's driven by a concept. It's definitely not something you see too often in fashion design. So when I saw Rebecca Turbow's line called "Safe Clothes"--I was intrigued both visually and mentally. 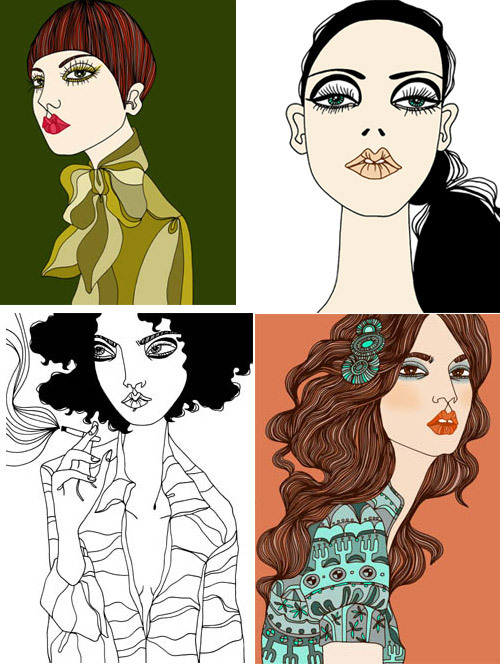 On the visual level, the space agey girls along the white and teal color palette spoke to my inner mod-girl. Mentally, I wondered why it would be called "safe"? According to Turbow, the clothes are meant to make the wearer feel emotionally and physically secure. And every detail underscores this concept. She utilizes both soft (for comfort) and sturdy (for durability) fabrics. The circular padded forms are strategically placed around areas that would need protection (i.e., vital organs like the heart). And teal is a soothing color which is why they're used in hospital scrubs. I like the fact that she thinks about details like this--so things that seem arbitrary are not. The thing is I would have liked her clothes anyway based on aesthetics alone. The concept is the icing on the cake. I hear she's expanding into menswear, childrens, and even home wares...can't wait to see it!